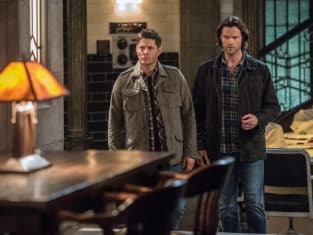 Can Sam, Dean and Mick stop Dagon’s attack? How do you stop a Prince of Hell? Maybe the Colt? Supernatural Season 12 Episode 17: "The British Invasion"
Dean: Dude, don't compliment the bad guys. Permalink: Dude, don't compliment the bad guys. Mrs. Winchester, I believe you're drawn to danger. Permalink: Mrs. Winchester, I believe you're drawn to danger. Supernatural Round Table: A Frustrating Episode?